Thus spake Assaf Benmelech, whose organization, “Ne’emanei Torah Va’Avodah,” seeks to promote “open and tolerant discourse” within Orthodoxy. That assertion has led to loud criticism from America, where the official Israeli rabbinate is being characterized as maintaining a “blacklist” and bowing to what one critic called “the more extremist elements among them” – the dreaded chareidim, of course. Mr. Benmelech’s characterization of YCT as representative of “modern Orthodoxy” does a grave disservice to Jews and institutions that have worn that latter label for decades. The movement with which the lawyer’s client is affiliated has indeed tried of late to shed its titular skin, exchanging “Open” for “Modern.” But (to shamelessly mix wildlife metaphors) the leopard has not changed its spots. The “Open Orthodox” movement, whatever it calls itself, is, simply put, not Orthodox at all. That is to say that it is theologically indistinguishable from the early Conservative movement, which at least had the honesty to admit that it was a new, divergent, endeavor. For its part, the Rabbinical Council of America does not accept YCT’s rabbinic certifications as credentials for membership; neither does the National Council of Young Israel. And Roshei Yeshivah at Yeshiva University have likewise rejected the appropriateness of “Orthodox” as descriptive of YCT. The movement and its supporters’ prevarication is evident too in the use of the word “blacklist” to describe what is, in the end, a simple insistence on standards. Medical students who have not demonstrated the knowledge or ethos needed to earn their accreditation have not been “blacklisted”; they have simply not made the grade. And if a medical association considers a particular medical school to be deficient in its training of doctors, the school’s degrees will not be recognized. It hasn’t been “blacklisted”; it has simply failed to meet the required standard. And so, the Israeli rabbinate has every right – and responsibility – to reject the credentials of those affiliated with YCT. Rav Moshe Feinstein, zt”l – whose teshuvos are duly cited by YCT leaders when they feel something in the Gadol’s decisions comports with some position they espouse – was clear that a mere affiliation with the Conservative or Reform movement invalidates a rabbi’s ability to offer testimony (Igros Moshe, Yoreh Deah 1:160). Over most of Jewish history, individual rabbanim’s testimonies were all it took to establish Jewish credentials, and geirus and gittin overseen by a beis din were not generally challenged. There were days, too, though, when halachah-observant Jews could judge the kashrus of a processed food by just reading the ingredients. Today, though, Jewish life is more complicated. Food products contain a laundry list of obscure colorings, flavorings and preservatives, from a multitude of sources. That’s why kashrus organizations were established, and why they are necessary. “Rabbis” today, too, have different ingredients and come in different flavors. If halachah is to be respected, standards are not only important but an absolute necessity. At least if Klal Yisrael matters. Tragically, in America today, there are, in reality, a multitude of “Jewish peoples,” born of the variety of definitions here of “Jewishness.” What is called “Jewish religious pluralism” has yielded an irreparable fracture of the American Jewish community. Innocent people, due to non-halachic conversions and invalid gitten, have become victims of the “multi-Judaisms” American model. That disastrous situation is largely not the case today in Israel, due to the single standard upheld by the country’s rabbinate, no matter how imperfect the institution’s bureaucracy may seem in some eyes. Were things otherwise, the largest Jewish community in the world, the one residing in Eretz Yisrael, would be as divided and incoherent, chalilah, as the American one. The maintenance of halachic standards are what have prevented that frightening scenario. Hamodia readers know that, of course. 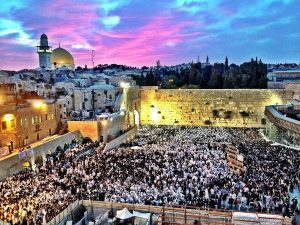 But our fellow American Jews need to realize that – if they truly care about Klal Yisrael – they need to move past umbrage-taking and political positioning and confront the Jewish future with honesty.